Stock status is current as of 4/18/2019 8:41 AMET. Enjoy the professional quality prints offered from the OKI printer. It is a B/W 9 pin dot-matrix utilizing 10 in (width) at 240 dpi x 216 dpi resolutions with print speeds of up to 570 char/sec. 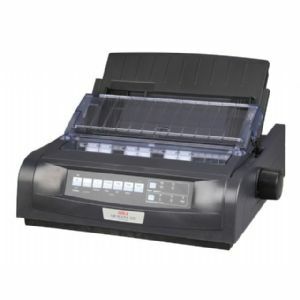 Its Parallel, USB, 10/100Base-TX allows you to connect to network devices.Its rugged print head with its 200-million character life delivers precise, sharp characters while an OKI closed-loop feedback system assures character placement accuracy. Order theOKI Microline Printer,a giant leap forward in impact printer performance.